Earth is estimated to be around 4.5 billion years old, with life first appearing around 3 billion years ago. To unravel this incredible history, scientists use a range of different techniques to determine when and where continents moved, how life evolved, how climate changed over time, when our oceans rose and fell, and how land was shaped. Tectonic plates – the huge, constantly moving slabs of rock that make up the outermost layer of the Earth, the crust – are central to all these studies. In the visualisation above, the colours refer to where the continents lie today. Light blue = India, Madagascar and Arabia, magenta = Australia and Antarctica, white = Siberia, red = North America, orange = Africa, dark blue = South America, yellow = China, green = northeast Europe. Below you can see: (a) map of Precambrian cratonic crust used in the reconstruction in their present-day locations; (b) present day geographical map of the world with Precambrian cratonic crust used in the reconstruction in grey. In the modern Earth, global positioning satellites are used to map how the Earth changes and moves. We know that up-welling plumes of hot rock from over 2,500 km (1,553 miles) deep in the planet’s mantle (the layer beneath the Earth’s crust) hit the solid carapace of the planet (the crust and the top part of the mantle). This forces rigid surface tectonic plates to move at the tempo of a fingernail’s growth. On the other side of the up-welling hot rock plumes are areas known as subduction zones, where vast regions of the ocean floor plunge down into the deep Earth. Eventually these down-going oceanic plates hit the boundary between the core and mantle layers of Earth, about 2,900 km (1,801 miles) down. They come together, forming thermal or chemical accumulations that eventually source these up-welling zones. It’s fascinating stuff, but these processes also create problems for scientists trying to look back in time. The planet can only be directly mapped over its last 200 million years. Before that, back over the preceding four billion years, the majority of the planet’s surface is missing, as all the crust that lay under the oceans has been destroyed through subduction. Oceanic crust just doesn’t last: it’s constantly being pulled back deep into the Earth, where it’s inaccessible to science. Using other methods, the latitudes of continents in the past can be worked out, as some iron-bearing rocks freeze the magnetic field in them as they form. This is like a fossil compass, with the needle pointing into the ground at an angle related to the latitude where it formed – near the equator the magnetic field is roughly parallel to the Earth’s surface, at the poles it plunges directly down. You can see this today if you buy a compass in Australia and take it to Canada: the compass won’t work very well, as the needle will want to point down into the Earth. Compass needles are always balanced to remain broadly horizontal in the region that they are designed to work in. Plate boundary locations also govern how ocean currents redistribute heat and water chemistry. Different water masses in the ocean contain subtly different elements and their various forms, known as isotopes. For example, water in the deep oceans was often not at the surface for many many thousands of years, and has different composition from the water presently on the ocean’s surface. This is important because different water masses contain different amounts of nutrients, redistributing them to different parts of the Earth, changing the potential for life in different places. 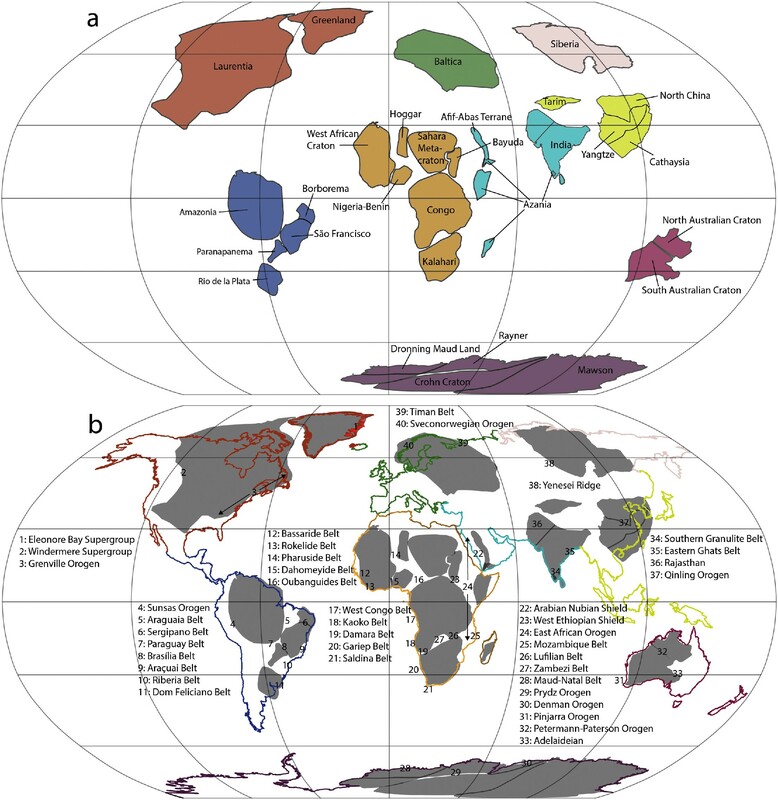 Neoproterozoic tectonic geography was dominated by the formation of the supercontinent Rodinia, its break-up and the subsequent amalgamation of Gondwana. The Neoproterozoic was a tumultuous time of Earth history, with large climatic variations, the emergence of complex life and a series of continent-building orogenies of a scale not repeated until the Cenozoic. Here we synthesise available geological and palaeomagnetic data and build the first full-plate, topological model of the Neoproterozoic that maps the evolution of the tectonic plate configurations during this time. Topological models trace evolving plate boundaries and facilitate the evaluation of “plate tectonic rules” such as subduction zone migration through time when building plate models. There is a rich history of subduction zone proxies preserved in the Neoproterozoic geological record, providing good evidence for the existence of continent-margin and intra-oceanic subduction zones through time. These are preserved either as volcanic arc protoliths accreted in continent-continent, or continent-arc collisions, or as the detritus of these volcanic arcs preserved in successor basins. Despite this, we find that the model presented here still predicts less subduction (ca. 90%) than on the modern earth, suggesting that we have produced a conservative model and are likely underestimating the amount of subduction, either due to a simplification of tectonically complex areas, or because of the absence of preservation in the geological record (e.g. ocean-ocean convergence). Furthermore, the reconstruction of plate boundary geometries provides constraints for global-scale earth system parameters, such as the role of volcanism or ridge production on the planet’s icehouse climatic excursion during the Cryogenian. Besides modelling plate boundaries, our model presents some notable departures from previous Rodinia models. We omit India and South China from Rodinia completely, due to long-lived subduction preserved on margins of India and conflicting palaeomagnetic data for the Cryogenian, such that these two cratons act as ‘lonely wanderers’ for much of the Neoproterozoic. We also introduce a Tonian-Cryogenian aged rotation of the Congo-São Francisco Craton relative to Rodinia to better fit palaeomagnetic data and account for thick passive margin sediments along its southern margin during the Tonian. The GPlates files of the model are released to the public and it is our expectation that this model can act as a foundation for future model refinements, the testing of alternative models, as well as providing constraints for both geodynamic and palaeoclimate models.